Peace, love and Minnetonka. Updated exclusively for our customers, the iconic Kilty moccasin is embellished with a studded heart on the left toe and a peace sign on the right. These statement-making moccasins are sure to promote whimsical good vibes with every step. So go on, spread some peace and love. I wore minnetonka's in the 70s. Had forgotten just how comfortable and well-made they are. Absolutely love them. We'll be buying more. I looked forever to replace a pair of flats then I found these. They do run a little wide if your foot is average but I planned to wear these only with socks. The suede is very flexible so the break-in time will be short. It'll take a little getting used to the sole since I've never had a pair of shoes with it. 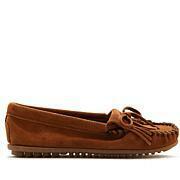 I bought these to add to my Minnetonka collection and these are my favorite! I always size down to accommodate the natural stretching that occurs. These are so darn cute, I plan on ordering a second pair! 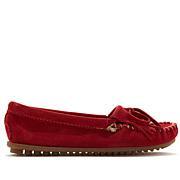 I have never had a bad Minnetonka moccasin and no shoe is more comfortable. Thanks HSN for making my shopping easier. I bought these to wear as slippers but have ended up wearing them all the time. Thedy are soooo cimfortable! 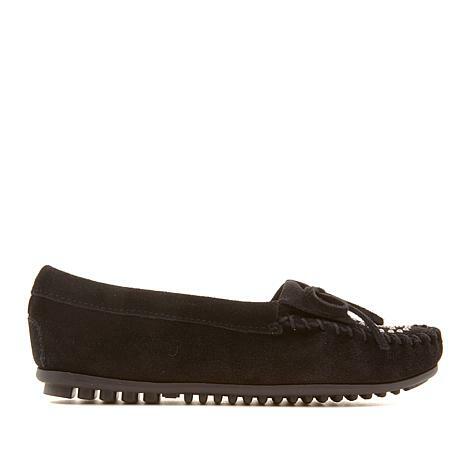 Even casual days can be glamorous when you wear these high-fashion moccasins from Baretraps. Laser-cut detail gives the classic slip-on design a fashionable edge. With a flexible, lightweight rubber sole and foam-padded insole, you'll make going to the grocery store a stylishly comfortable event.